Puff pastry is great to have on hand as a quick time-saver. It works in a pinch when I don’t have time to make the dough for those stuffed bread recipes Italians are so fond of. 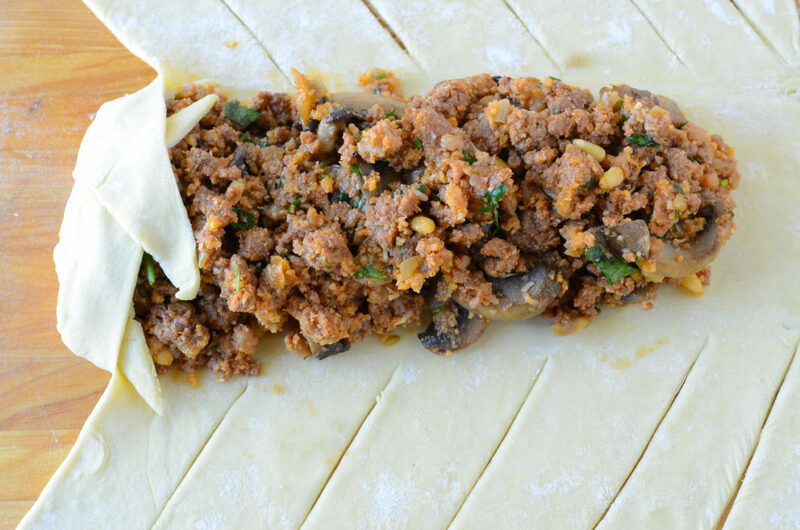 You can use just about any filling you would use for a calzone, pizza, or rotolo. 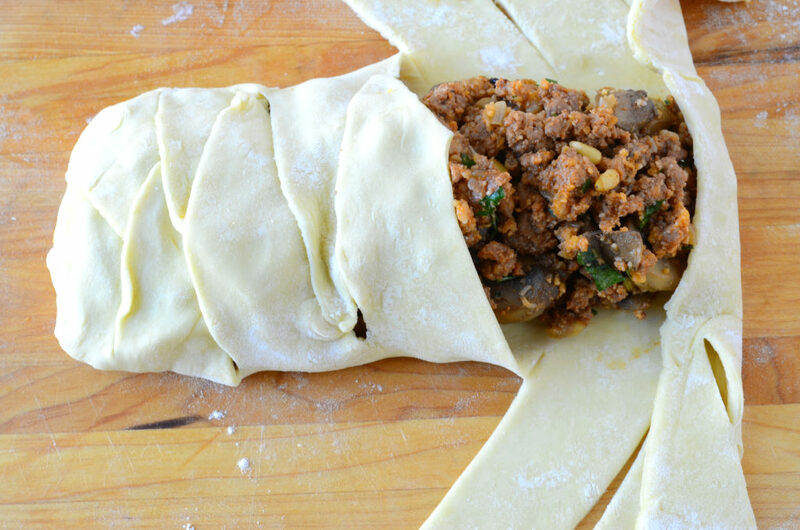 This recipe uses a ground beef, sausage, mushroom, currant, and pine nut filling. 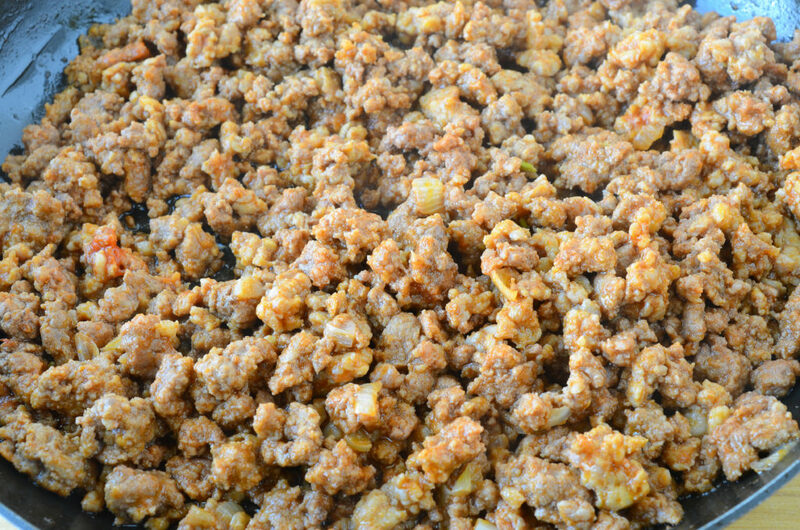 MAKE THE STUFFING: Heat 2 tablespoons olive oil in a skillet over medium-high heat. Add the onion and cook 5 minutes. Stir in the remaining oil and butter. 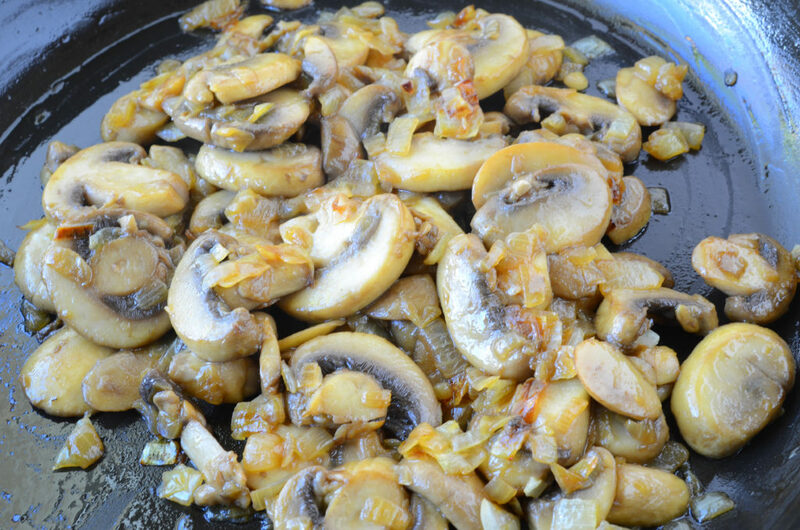 Add mushrooms and cook 8 to 10 minutes, until tender and the juices are evaporated. Transfer vegetables to a large bowl. Using the same skillet, brown the beef and sausage. Stir in the tomato paste and wine. Cook approximately 5 minutes, until the wine is reduced, and the mixture thickens. Transfer to the bowl with vegetables. 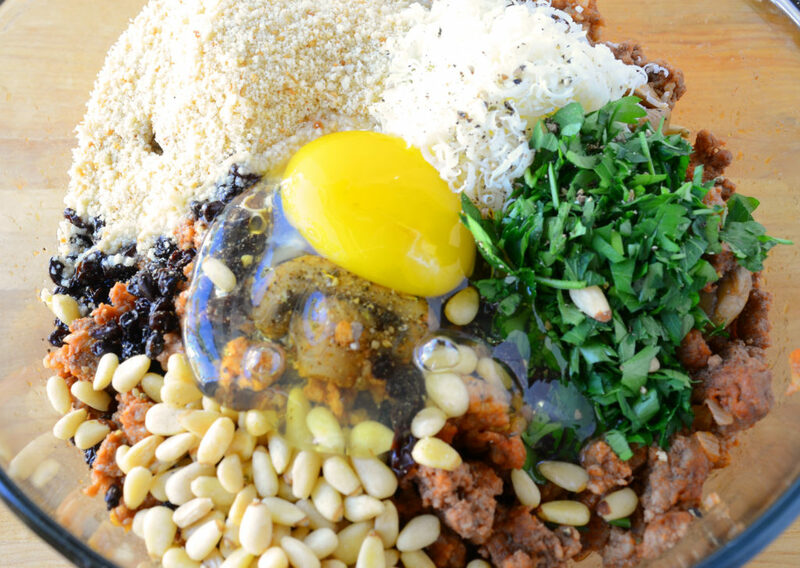 Stir in the cheese, parsley, currants, pine nuts, egg, marjoram, and bread crumbs until combined. Season with salt and pepper. 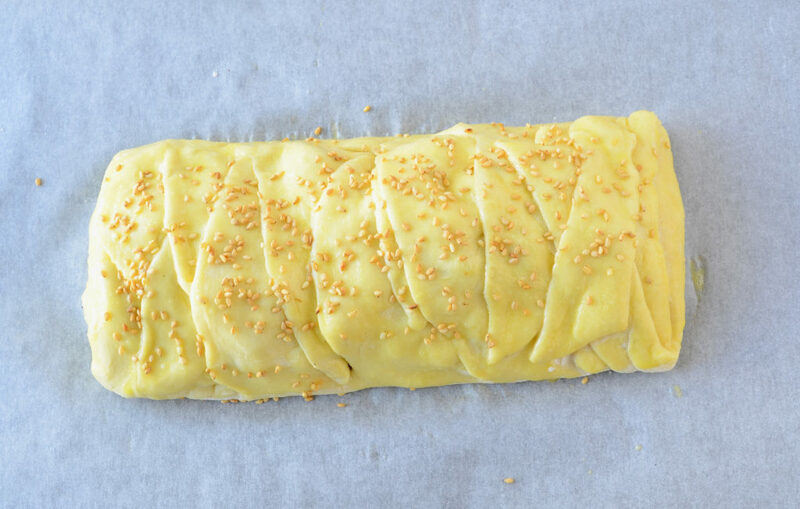 MAKE THE PUFF PASTRY BRAID: Preheat oven to 375 degrees F. Line a baking sheet with parchment paper. 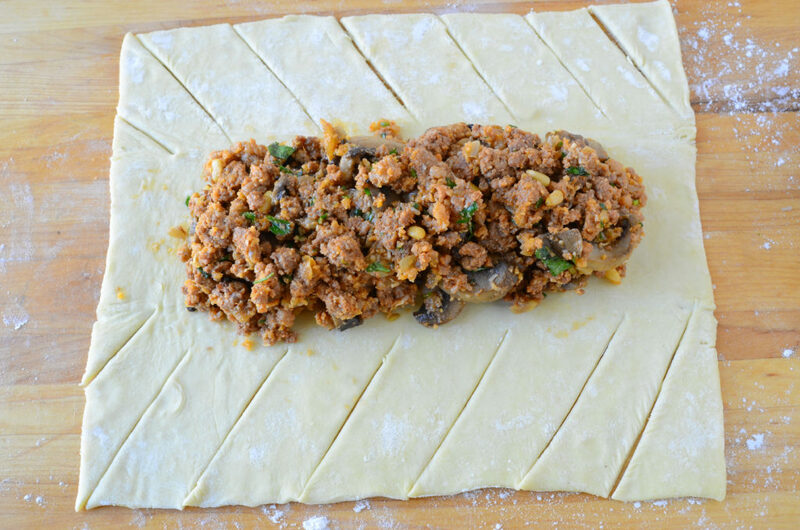 Unfold the pastry sheet on a lightly floured board and roll out to a 12-by 14-inch rectangle. Mound the filling lengthwise, along the middle third of the pastry sheet, leaving a 1-inch border at the top and bottom end. 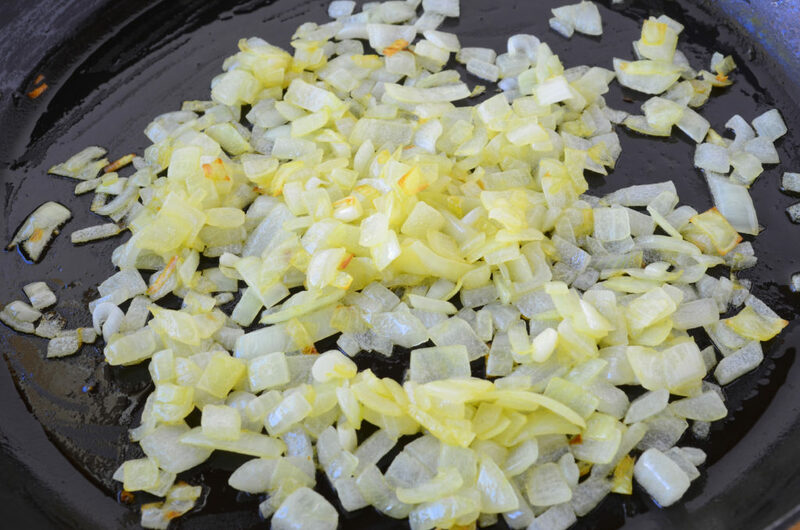 Cut 1 1/4-inch wide strips, diagonally along the sides and 1/2-inch from the filling. Fold the top and bottom end over the filling. Cut off and discard the bottom triangular ends if desired. Starting at the end closest to you, alternately fold the strips over the filling. 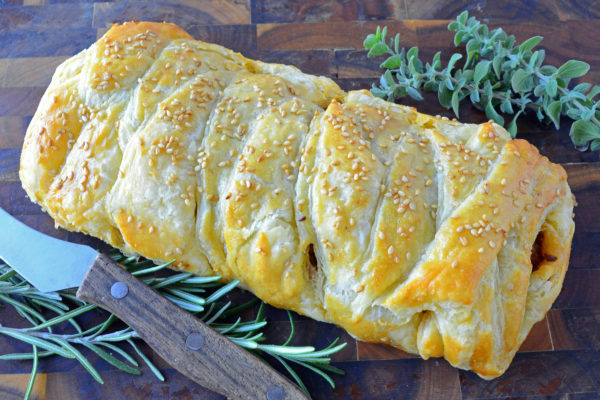 Place the braid on the baking sheet. Brush the top with the beaten egg and sprinkle with sesame seeds. Bake for 30 minutes, until golden brown.